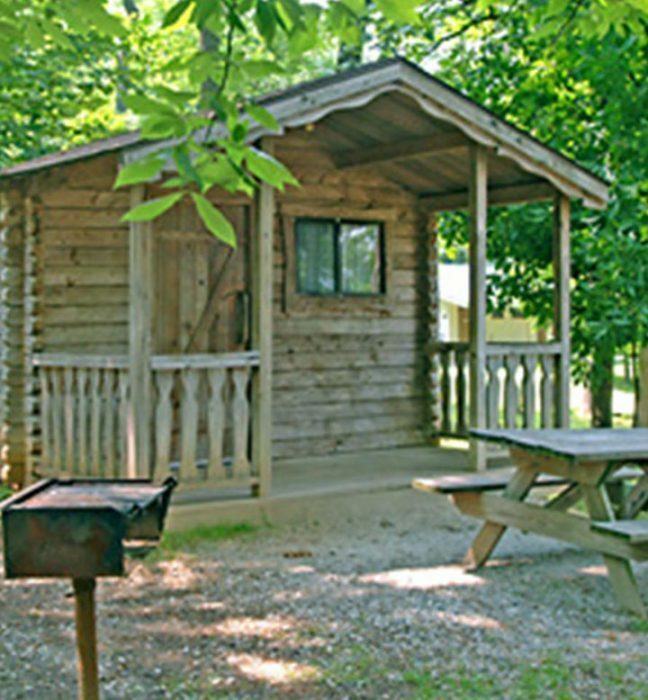 Our two-room rustic cabins are nestled in the woods of the Main Camp Area situated close to the main bathhouse for your convenience. Granite Hill cabins sleep a maximum of six people in 1 double bed and two sets of bunk beds. They are equipped with electricity, lights, ceiling fans, a picnic table, outdoor spigot, and charcoal grill. Campers should bring along sleeping bags, dishes, cookware, and a cooler. Pets are not permitting in the cabins. All cabins are non-smoking. Cabin reservations must be paid in full at the time of reservation. An additional $50 CASH (refundable) security deposit is required upon check-in. Security deposit is refunded after the cabin is checked by guest services at check-out. Rates are based on 2 adults, 2 children & 2 cars. 10% discount for Good Sam, AAA, AARP, and Active Military. Not valid on holidays, weekly rates, special event rates or bluegrass festival rates. Deposits: Cabins must be paid in full at the time of the reservation. Cancellation: 14 days notice required for a refund less a $10 service charge or credit to a new future reservation within the same camping season. Early Check-In and Late Check-Out can be arranged in advance for an additional fee.